ISMAIL SERAGELDIN, Founding Director of the Bibliotheca Alexandrina (BA), the new Library of Alexandria, inaugurated in 2002, is currently, Emeritus Librarian, and member of the Board of Trustees of the Library of Alexandria. He is advisor to the Egyptian Prime Minister in matters concerning culture, science, and museums. He serves as Chair and Member of a number of advisory committees for academic, research, scientific and international institutions, including as co-Chair of the Nizami Ganjavi International Center (NGIC), and serves on the Advisory Committee of the World Social Science Report for 2013 and 2016, as well as the UNESCO-supported World Water Scenarios (2013) and the executive council of the Encyclopedia of Life (2010) and Chairs the Executive Council of the World Digital Library (2010). He has held many international positions including as Vice President of the World Bank (1993–2000). He also co-chaired the African Union’s high level panel for Biotechnology (2006) and again for Science, Technology and Innovation (STI) in 2012-2013, and was a member of the ICANN Panel for the review of the internet future (2013). 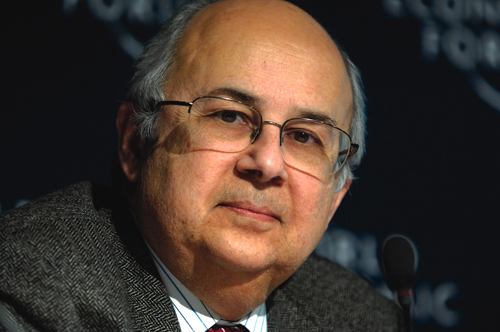 Dr. Serageldin has received many awards including: First recipient of Grameen Foundation (USA) Award for a lifetime commitment to combating poverty, (1999); Officer of the Order of Arts and Letters awarded by the government of France (2003); Pablo Neruda Medal of Honor, awarded by the Government of Chile (2004); The Bajaj Award for promoting Ghandian values outside India (2006); Order of the Rising Sun – Gold and Silver Star awarded by the Emperor of Japan (2008); Champion of Youth Award by the World Youth Congress, Quebec (2008); Knight of the French Legion of Honor awarded by the President of France (2008); The Swaminathan Award for Environmental Protection (Chennai, India, 2010); Millennium Excellence Award for Lifetime Africa Achievement Prize, by the Excellence Awards Foundation, Ghana (2010); The Public Welfare Medal, by the National Academy of Sciences, Washington DC (2011); Commander of the Order of Arts & Letters awarded by the government of France (2011); Nizami Ganjavi Gold Medal of the Republic of Azerbaijan awarded by Azerbaijan National Academy of Sciences (2015); The “Dostlug” Order (Order of Friendship) of Azerbaijan awarded by President of Azerbaijan (2015); Marianna V. Vardinoyannis Foundation Award (2016); Honorary Sign of the President of the Bulgarian Academy of Sciences (2016). He has lectured widely all over the world including delivering the Mandela Lecture (Johannesburg, 2011), the Nexus Lecture (Netherlands, 2011), the Keynote Address to the First International Summit of the Book (Washington DC, 2012). He was distinguished professor at Wageningen University and at the College de France. 1996: Doctor of Sociology, University of Bucharest, Romania. 1996: Doctor of Agricultural Science, University of Melbourne, Australia. 1997: Doctor of Science, Indian Agricultural Research Institute, India. 1998: Doctor of International Affairs, American University, Washington, DC, USA. 1998: Doctor of Science, Punjab Agricultural University, India. 1998: Doctor of Science, Tamil Nadu Veterinary & Animal Sciences University, India. 1998: Doctor of Natural Resources Management, Ohio State University, USA. 1999: Doctor of Science, Tamil Nadu Agricultural University, Coimbatore, India. 1999: Doctor of Science, ANGRAU, Hyderabad, India. 1999: Doctor of Economics and Management, CNAM, Paris, France. 1999: Doctor of Science, Egerton University, Kenya. 1999: Doctor of Agricultural Science, University of Tuscia, Italy. 2000: Doctor of Humane Letters, American University in Cairo, Egypt. 2002: Doctor of Science, SNHU, Manchester NH, USA. 2003: Doctor of Science, McGill University, Montreal, QC, Canada. 2004: Doctor of Letters, University of Technology, Sydney, Australia. 2004: Doctor of Letters, Université Paul Sabatier, Toulouse, France. 2005: Doctor of Laws, University of Minnesota, Minneapolis, USA. 2006: Doctor of Letters, Université de Nantes, Nantes, France. 2007: Doctor of Science, Azerbaijan State Economic University, Baku, Azerbaijan. 2007: Doctor of Society Development, Khazar University, Baku, Azerbaijan. 2008: Doctor of Letters, Laval University, Quebec, Canada. 2009: Doctor of Arts, Beirut Arab University, Beirut, Lebanon. 2009: Doctor Diploma, Azerbaijan Cooperation University, Baku, Azerbaijan. 2009: Doctor Diploma, National Academy of Sciences, Institute of History, Baku Azerbaijan. 2009: Doctor of Letters, University of Dublin, Dublin, Ireland. 2010: Doctor Degree, ANAS Institute of Oriental Studies, Baku, Azerbaijan. 2010: Doctor Degree, Georgian American University, Tbilisi, Georgia. 2010: Doctor Degree, Free University of Tbilisi, Georgia. 2012: Doctor Degree, University of Georgia, Tbilisi, Georgia. 2012: Doctor Degree, Ilia State University, Tbilisi, Georgia. 2012: Doctor Degree, State Agricultural University, Ganja, Azerbaijan. 2012: Doctor Degree, Odlar Yurdu University, Baku, Azerbaijan. 2016: Doctor Degree, Ganja State University,Ganja, Azerbaijan. Member of the High Level Group (HLG) of the Secretary-General’s UN initiative for the Alliance of Civilizations, (2005-2006). In addition, he was active in promoting NGO-Bank relations, and served as Co-Chairman of the NGO-Bank Committee (1997-1999). Prior to joining the World Bank, he worked as a consultant in city and regional planning, and taught at Cairo University and Harvard University. Reflections on Education: On Education and the Future of the Arab World: Tomorrow’s Universities and the Seven Pillars of Knowledge Revolution, 2013. 2006: The Jamnalal Bajaj Award, for promoting Ghandian values outside India. 2017: The Order of George Kastrioti Skanderbeg issued by the President of the Republicof Albania.